We’ve taken all the know-how and feedback from 11 years of video capture experience with VGA2USB and used it to develop our easiest to use video grabber device, AV.io HD. AV.io HD has the same size, shape and durability as VGA2USB, but packs a lot more functionality into the same form factor! With no drivers to install, you can use AV.io HD on any Windows, Linux or Mac computer that has a USB port. AV.io HD captures video from VGA, DVI and HDMI sources, and when used with USB 3.0 ports, it does this at 60 frames per second! Do you want more information about VGA2USB successors? VGA2USB – Compact pocket sized, external, low cost VGA video grabber capable of capturing output from virtually any VGA source, such as a computer running Windows, Mac OS X, Linux as well as embedded systems such as medical devices, scientific or lab equipment. VGA2USB is Epiphan’s lowest priced video grabber. It’s durable, autonomous design and compact size make it an ideal companion for AV professionals. It slips into a laptop case or shirt pocket making it easy to transport between locations and integrate into existing systems. Professionals tasked with creating and recording slide shows, training sessions, how to videos, and recording output from scientific devices can capture video from any VGA source within a few minutes. VGA2USB is a full-featured VGA/RGB video grabber complete with hardware, USB cable and software capable of capturing video from any screen, displaying captured data in real time, saving captured video and images to disk, copying captured images to a clipboard, or recording captured images as a series of consecutively saved files. Furthermore, VGA2USB is compatible with virtually any third party software that supports an external video device or webcam, including Skype and Windows Media Encoder. VGA2USB is self-powered through the USB port, and requires no additional power; it sends a digitized video signal from VGA to USB. When choosing a video grabber or recorder, it is important to consider the video content. If you plan to capture fast moving video it’s best to choose a video grabber that captures video at a high frame rate versus capturing a slide presentation or x-ray results where capturing at a high frame rate is not critical to your video recording. Epiphan recommends VGA2USB for customers who need to capture video from VGA sources at resolutions up to 1920×1200 at low frame rates. 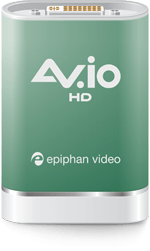 Professionals who require a video grabber capable of capturing analog and digital signals at higher resolutions and frame rates, check out Epiphan’s DVI2USB 3.0. 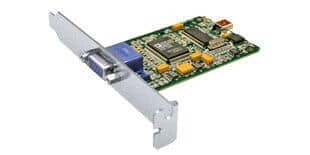 Compact pocket sized, external, low cost VGA video grabber capable of capturing output from virtually any VGA source—such as a Windows PC, a Mac OS X, a Linux OS, an em­bed­ded system, a medical device, scientific or lab equipment, and more. VGA2USB is designed to capture analog sources. Can be inconspicuously set up on the medical cart, lecture podium, or desk and within easy reach. Rugged yet lightweight design is ideal when moving from office to boardroom, laboratory or anywhere you need to capture video. Power over USB eliminates the need for AC power connection; the device is powered directly over the USB port. Roughly the size of a box of paper clips, it can easily be slipped in your pocket or laptop case. No internal fans or other moving parts; it is silent and reliable. Add company-related information, corporate color and a time stamp to identify your video. Choose color, style and location on the screen where the custom information is displayed. 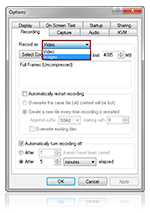 Control how VGA2USB records images and video. Record captured images and video as a series of consecutively saved graphic files or as one video file. All our video grabbers come with Epiphan’s capture tool which provides a seamless interface to a wide range of industry standard encoding and streaming software. To maintain the highest standard of product performance we upgrade the video grabber firmware from time to time. Upgrades are free and your video grabber notifies you when a firmware upgrade is available. Ready to capture as soon as it has power and an input signal. VGA2USB saves captured images and video to the most widely used video file formats, AVI files on Windows and MOV files on Mac. Professionals can focus on their core business, without having to navigate through a complex user interface, connectors and cables. VGA2USB comes with the cables you need to capture VGA signals. With the click of a button, professionals can capture and record input from any device with a VGA signal.